Acrylic on canvas, 90 x 114 inches. Rubell Family Collection, Miami. Robert Colescott’s distinctive style of figurative expressionism is confrontational, humorous, and subversive. 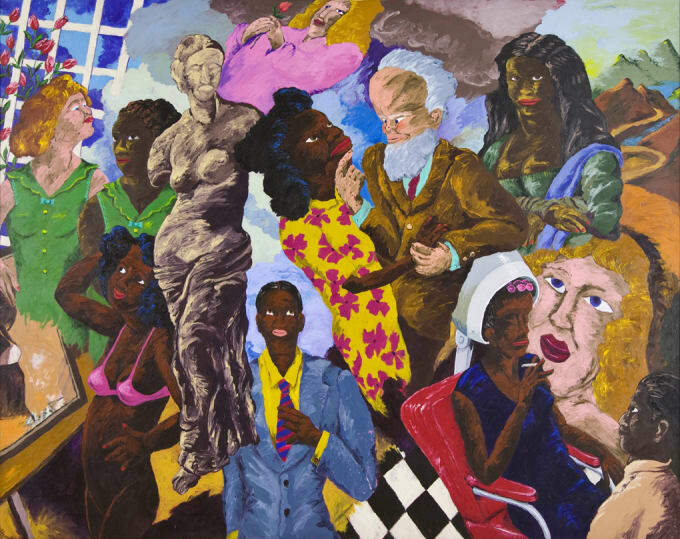 Often referring to specific stories from history and from art, Colescott’s work challenges racial and gender stereotypes and provokes viewers to question received truths. Pygmalion recalls the myth of the artist who falls in love with his own creation. Colescott’s painting is a dreamlike scene that suggests and skewers various models of aesthetic, educational, and social betterment. Cartoonish, colorful, and bold, it is a poke in the eye of standard accounts of culture. Robert Colescott’s irreverent take on tradition has been foundational to the work of generations of artists who came after him, including Kehinde Wiley and Kara Walker.